Germinate seeds before you sow them in potting mix. Pre-sprouting helps accelerate your tomato seedling crop. Pre-sprouting is easy. It takes just a couple of days. When you germinate tomato seeds before planting them, they have a greater chance of growing into seedlings than those you sow directly. 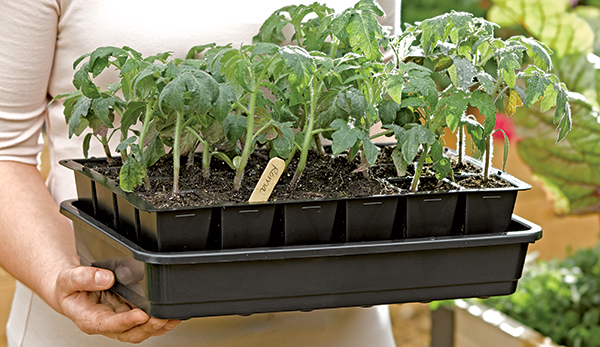 You’ll give your seeds a jump start on the growing season. Plus, you’ll get more plants from the same amount of seeds that you sow directly into your indoor pots. Moisten a single paper towel sheet or paper napkin. Paper should be damp but not sopping wet. Sprinkle tomato seeds on paper towel so they are not touching. Seeds will adhere to paper. Use only one variety of tomato seed per roll. If you’d like to pre-sprout just a few seeds of one variety, tear the paper towel into smaller sections. Starting at one end, roll the paper towel or napkin loosely in cylinder-fashion. Place the rolled paper towel into a zipped plastic bag. Label the bag with tomato variety and date. Place bag in a warm place away from drafts, such as on the top of the refrigerator or stereo. Or use a seedling heat mat. Check the seeds a couple of times each day for germination. Carefully unroll the paper cylinder and look for the root emerging from the seed. Some seeds germinate within 24-48 hours. Other varieties, especially smaller varieties and those suited to grow in containers, take longer to sprout – as much as 10-14 days. As soon as the seed’s tap root emerges, plant your germinated seeds. Plant your germinated seeds in seed cell trays within 12-24 hours of sprouting. Be careful to not allow the seed’s root to grow too long while still in the paper towel, or the root will penetrate the paper and be difficult to manipulate without breakage. Once the root is broken, your seed will no longer be viable. How to grow tomatoes from seeds – is it really hard to do?